Have you accidentally deleted images from your PC or storage device? Has your storage device become corrupted? Here's how to recover your data. Have you accidentally formatted a memory card? Has your SD card or hard drive become corrupt? Fear not as EaseUS have a comprehensive data recovery software for both Windows and Mac users which can help you recover your lost files. Recover unlimited data and get 40% off your purchase - use code AFF-RZXCBV at the checkout. EaseUS Data Recovery Wizard Pro is simple to use and makes the date recovery process smooth and efficient, along with peace of mind that files won't be overwritten. In just 3 clicks, the software can track down your files and recover them. Simply launch the software, scan the affected device and you'll be on your way to recovering the data. With EaseUS Data Recovery Wizard Pro, there are no limits on how much data can be recovered, so even the largest 4K video files can be back with you quickly. You can preview and choose the items you want to recover before going ahead, so there's no time wasted. Select the location of your lost files: Launch the software and find the location that you lost your data from. Scan for your lost files: Start scanning and the software will retrieve your data. You can pause the recovery process and resume later if you need to. Preview and recover: Filter through the results and select what you'd like to recover. You can preview the files before recovering. 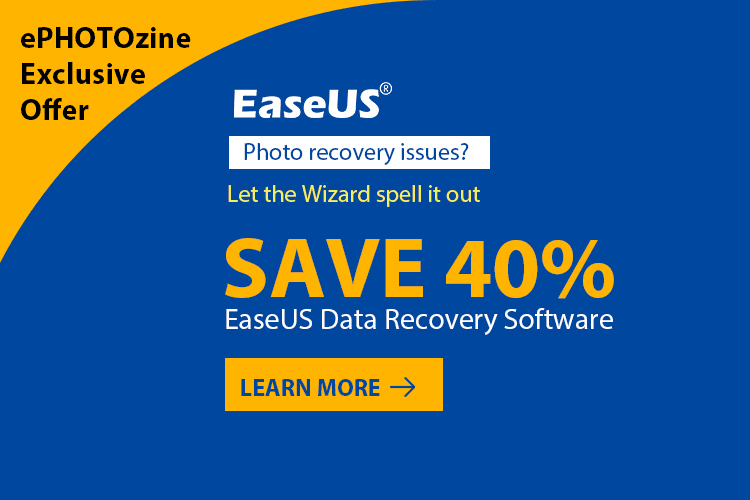 ePHOTOzine have teamed up with EaseUS to give a huge 40% discount on their software to our members. Just use code AFF-RZXCBV at the checkout (click the 'check to enter coupon code' box) to take advantage of this great offer.